SX723 Portable pH/mV/Conductivity Meter Kit - Oasis Scientific Inc.
· Large dual-display LCD shows measurement plus °C/°F temperature. · Provides accurate pH, mV, conductivity, TDS, salinity, resistivity, and temperature measurements. measurements in the range of 0.5μS/cm~200mS/cm. · Set coefficient from 0 to 10% for accurate compensation in almost any solution. 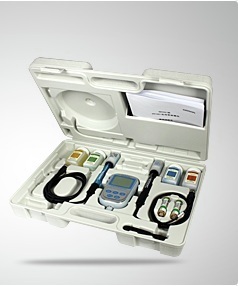 · Choose from USA or NIST pH buffer sets. · Automatic shutoff function and low battery indication. · Memory function stores and recalls up to 300 data sets. · Water-proof and dust-proof body meets IP57 standard. standard solution (50mL), User’s manual, Screw driver, Spare AA batteries (2 pieces), and Hard plastic carrying case.